This stately Italianate-style brick mansion Lincoln, RI was built in 2016 and situated on 3.5 acres of land. It features approximately 8,118 square feet of living space with five bedrooms, five full and one half bathrooms, formal living room with 20' ceiling and fireplace, formal dining room, gourmet kitchen with stainless steel appliances, breakfast room, family room built-in shelving and fireplace, home office with fireplace, billiard's room, a separate guest house bedroom, kitchenette, and two full bathrooms, a two-car garage, and much more. Outdoor features includes a motor court, balconies, courtyard with fountain, covered patio with fireplace, a breezeway and bridge. This stately stone mansion in Greenwich, CT pulls inspiration from the great homes of the Renaissance period. It was built in 2011 and is situated on three acres of land with pond frontage. The Wadia Associates-designed mansion features approximately 12,682 square feet of living space with six bedrooms, eight full and four half bathrooms, two-story foyer with floating staircase, elevator, formal living and dining rooms with fireplaces, butler's pantry, gourmet kitchen with reflection ceiling, family room with fireplace and exposed beam vaulted ceiling, wood paneled library with fireplace, home office, sitting room, recreation with media center, exercise room, golf simulator, indoor putting green, and a three-car garage. Outdoor features include a motor court, covered and open terraces, pergola, fireplace, swimming pool with spa, pavilion with BBQ kitchen, and a tennis court. Situated on an island within an island with uninterrupted marsh views, this Shingle-style mansion was built in 2001 and sits on 9.5 acres of land in Hilton Head Island, SC. It features approximately 10,020 square feet of living space with six bedrooms, six full and two half bathrooms, two-story with staircase, two-story great room, formal dining room, butler's pantry, country-style gourmet kitchen, breakfast room, planning office, family room with fireplace, home office/library with vaulted ceiling and fireplace, exercise room, 2,500-bottle wine cellar, three-car garage, and much more. Outdoor features include covered front porches, covered rear porch with fireplace, pergola, BBQ kitchen, patio and an infinity-edge swimming pool with spa. This stately mansion in Franklin, TN was built in 2002 and is situated on a 1.9 acre corner lot with resort-quality grounds. It features a combined 15,633 square feet of living space with seven bedrooms, 11 full and two half bathrooms, two-story foyer with winding staircase, two-story great room with fireplace, formal dining room, butler's pantry, gourmet kitchen with double islands, breakfast area and stainless steel appliances, two-story family room with fireplace, paneled billiards room, study loft, home office, wine cellar, home theater, exercise room, and a four-car garage. The pool house features a spa area with steam shower and changing room, floating staircase, and apartment with living area, bedroom, and kitchen. Outdoor features include a motor court, covered and open patios, formal gardens, swimming pool with spa, and a cabana. This newly built stone and shingle mansion in Rockville, MD was constructed by Classic Homes of Maryland and situated on an acre of land. It features approximately 8,400 square feet of living space with six bedrooms, six full and two half bathrooms, two-story foyer with staircase, elevator, formal living and dining rooms, gourmet kitchen with stainless steel appliances, a prep kitchen, breakfast room, two-story family room with fireplace, a study, a finished lower level with recreation room, wet bar, wine cellar, home theater, and much more. A three-car side-loading garage is located back on the main level. Outdoor features include a covered front porch and a rear patio. 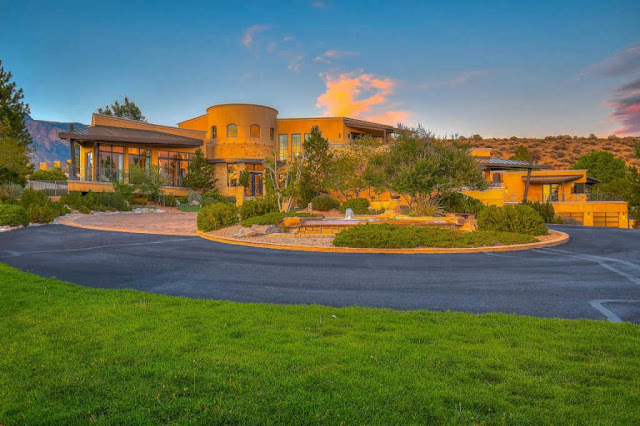 This mountainside home in Carefree, AZ was built in 1984 and is situated on just 9.84 acres of land that boasts panoramic views of Arizona Valley's neighboring mountain ranges. 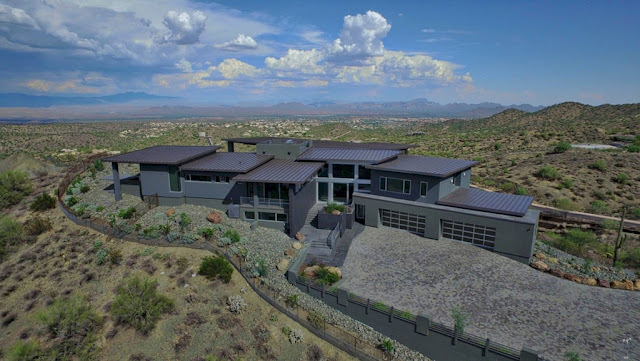 Dubbed "Black Mountain Manor", the Tuscan-inspired home features four bedrooms and five bathrooms, formal living room with marble fireplace, a paneled lounge with wet bar, formal dining room, remodeled gourmet kitchen with stainless steel appliances, and a breakfast/family room with vaulted ceiling, fireplace, and bar. The floating staircase leads to the expansive lower level which features a recreation room with fireplace and a private guest suite with bedroom, full kitchen, living area and private entrance. A three-car garage is located back on the main level. Outdoor features include a gated entrance, motor court, fountain, wrap-around terrace, covered and open patios, BBQ kitchen, and a free form swimming pool with spa. Here we are folks! Finally! The first ever 'INTERIOR MOTIVES'! I've been wanting to launch this feature of The American Man$ion after a pretty successful ADDRESSING THE AGENT launch back in October. I mean, a great deal of my blog is about interior design, so it was only right to begin featuring some incredible designers. So some time ago, I started following a bright young interior designer on Instagram. Her stories impressed me! I saw that she loved what she does and takes it very seriously. She had a fresh sense of style, a style that stood out and that is hard to do on social media at times because so much of it is gloss. Of course I contacted her and asked if she'd like to lead the charge for my new 'INTERIOR MOTIVES' features. And she gratefully agreed. 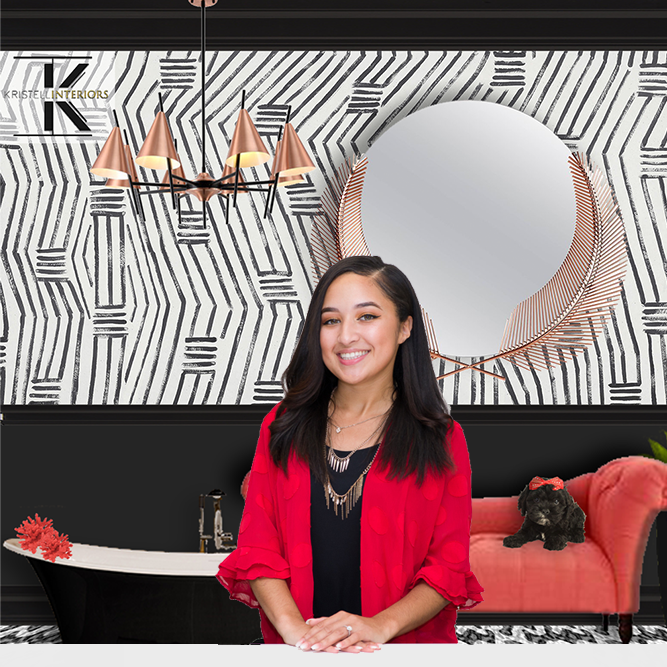 It's been a few weeks in the making but without further delay, please enjoy this casual Q&A-style interview with Chalice K. Johnson, Founder and Principal Designer of Kristell Interiors, LLC! 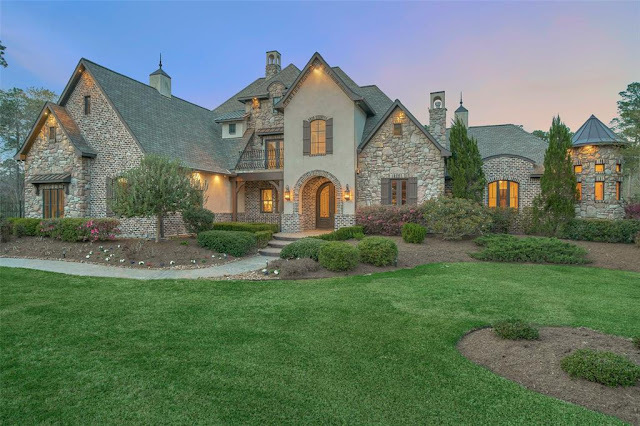 This Zampolin & Associates-designed brick and stone-accented English Tudor mansion in Franklin Lakes, NJ was built in 2000 and is situated on 5.4 acres of land. The stately home has been the backdrop of Bravo's nine-season running Real Housewives of New Jersey and features approximately 14,000 square feet of living space. It has seven bedrooms, seven full and three half bathrooms, two-story foyer with floating spiral staircase, two-story great room with massive fireplace and hand-painted mural, formal dining room, butler's pantry, gourmet kitchen with breakfast bar, breakfast room, family room, wood-paneled home office/library with fireplace, billiards room with fireplace, 12-seat home theater, 3,500-bottle wine cellar with tasting room, garage parking for up to seven cars, and much more. Outdoor features include a gated entrance, motor court, front and rear terraces, flagstone patio, free form swimming pool with spa, waterfall and water slide, and a pool house. 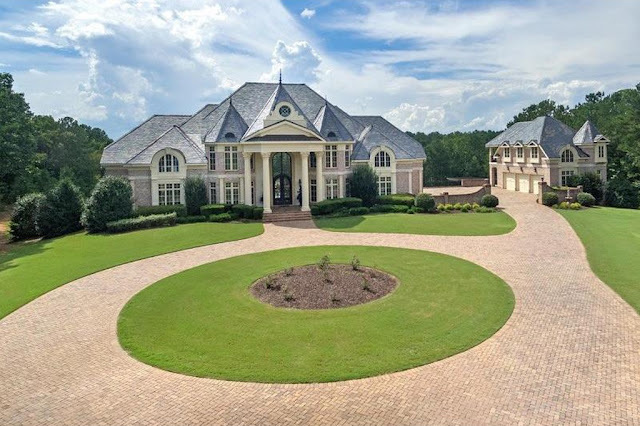 This European-inspired brick mansion in Newnan, GA was built in 2006 and is situated on 23 acres of land boasting a private six acre lake. It features approximately 19,341 square feet of living space with six bedrooms, six full and one half bathrooms, two-story foyer with floating double staircase and hand-painted dome, elevator, formal living room with fireplace, two-story great room, formal dining room, butler's pantry, gourmet kitchen with Hibachi-style cooktop, breakfast room, family room with fireplace, billiards room, recreation room, 10-seat home theater, a one-bedroom guest suite with full kitchen, garage parking for six cars, and much more. Outdoor features include a gated entrance, motor court, front portico, upper and lower terraces, swimming pool, pergola, and a tennis court. 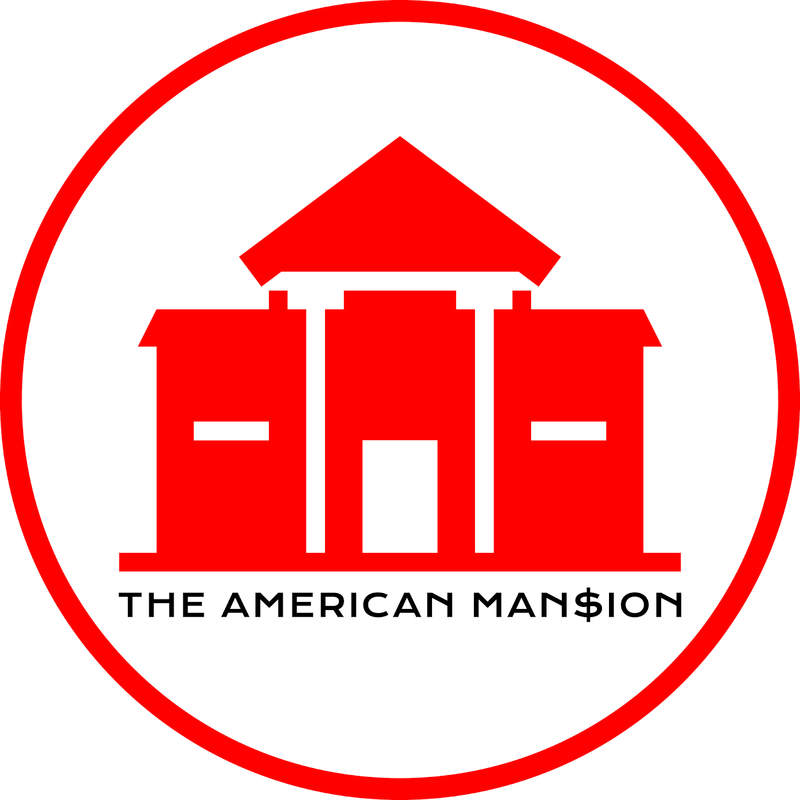 Palazzo Della Felicita is a newly built limestone mansion in Washington, DC that is situated on nearly an acre of land. It features approximately 16,850 square feet of living space with 11 bedrooms, 12 full and five half bathrooms, two-story foyer with double staircase and custom-designed dome, elevator, two-story great room with fireplace, formal dining room, butler's pantry, gourmet kitchen, family room with fireplace, a completely wood-paneled library and home office with fireplace, and a third floor bonus room. 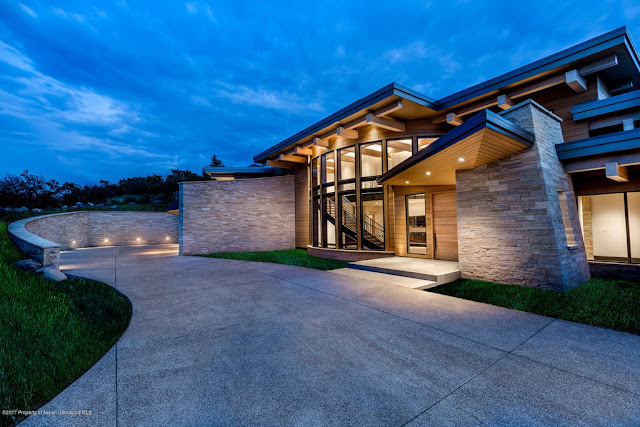 The expansive lower level includes a recreation room with wet bar and fireplace, wine cellar, an eight-seat home theater, second kitchen with stainless steel appliances, exercise room, a spa area with steam shower and sauna, and an eight-car subterranean garage. Outdoor features include a front terrace, rear upper terrace with fireplace, patio, BBQ kitchen, pergola, swimming pool with water features, and a two-story pool house with kitchen, sleeping, and living areas. 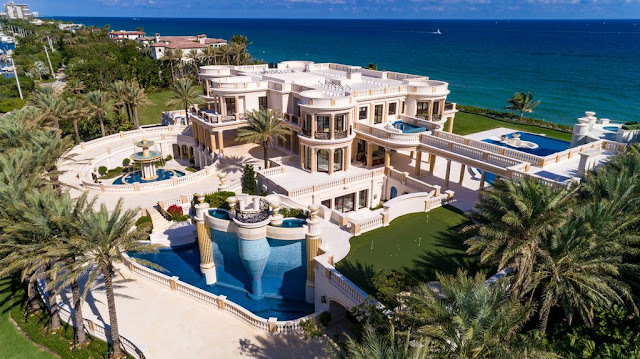 This Mediterranean-style mansion in Jupiter, FL was built in 2013, is situated on 0.67 acres of land, and boasts 105 feet of uninterrupted waterfrontage. It features approximately 9,154 square feet of living space with seven bedrooms, seven full and three half bathrooms, two-story foyer with staircase, formal living room with fireplace, formal dining room, gourmet chef's kitchen with double islands, breakfast room, family room, an upper level media/recreation room, 10-seat home theater with wet bar, garage parking for eight cars, and much more. Outdoor features include a gated entrance, motor court, balconies, a loggia with BBQ kitchen, a cabana, patio, swimming pool with spa, fire pit, and a dock. This Zampolin & Associates-designed brick and stone-accented mansion in Alpine, NJ is situated on just under an acre of land. It features seven bedrooms (the master suite boasts a two-story closet), eight full and three half bathrooms, two-story foyer with floating staircase, elevator, formal living room with fireplace, formal dining room, butler's pantry, gourmet kitchen with breakfast area, great room fireplace and coffered ceiling, home theater, billiards room with wet bar, recreation room, home gym, a three-car garage, and much more. Outdoor features includes patios and a free form swimming pool with spa. One of Florida's most over-the-top estates has finally sold to a very fortunate buyer! 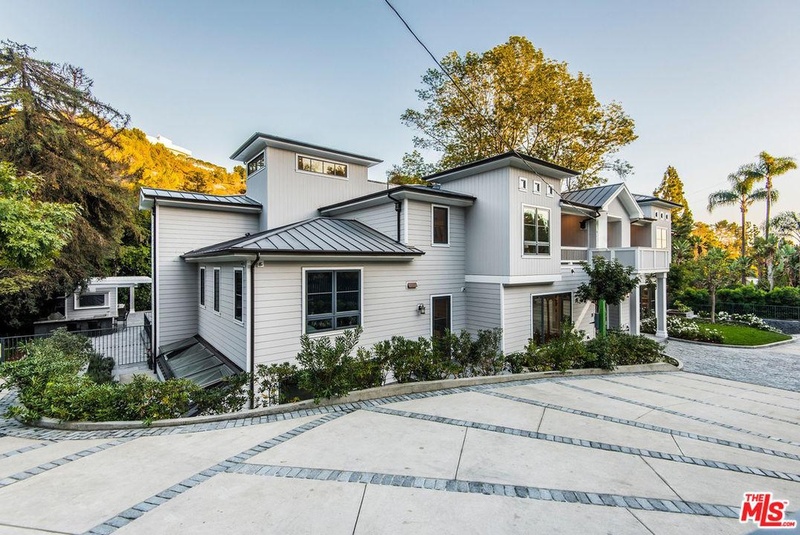 The mega home first hit the market in 2014 to the tune of $139,000,000. 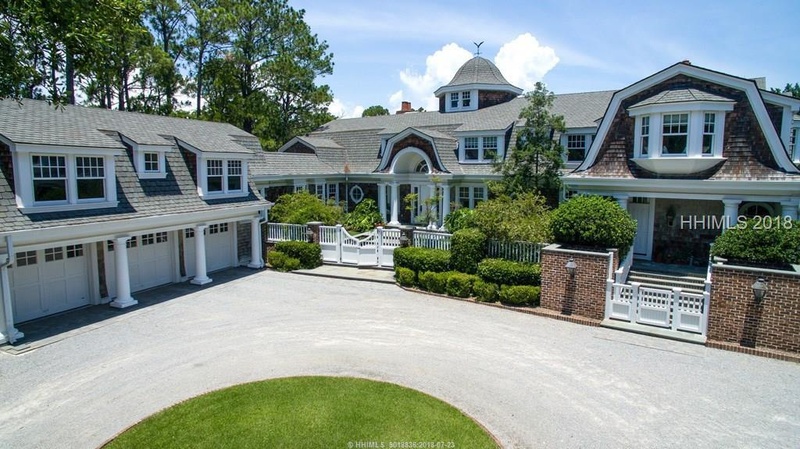 A couple of years later, it was re-listed for $139,000,000. 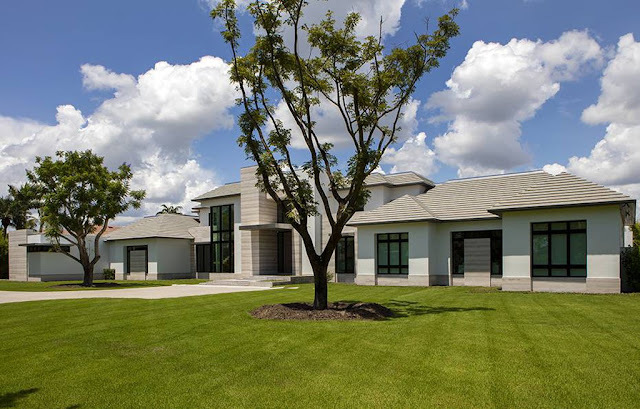 Nearly five years later, Florida's jewel property was sold for a "modest" $42,500,000-a steal considering, it was at one time being offered for $117,000,000 more than what it sold for! The home dubbed "Playa Vista Isle" in Hillsboro Beach, FL is situated on five acres of land and features a combined 60,000 square feet of living space and boasts ocean and Intracoastal frontage. 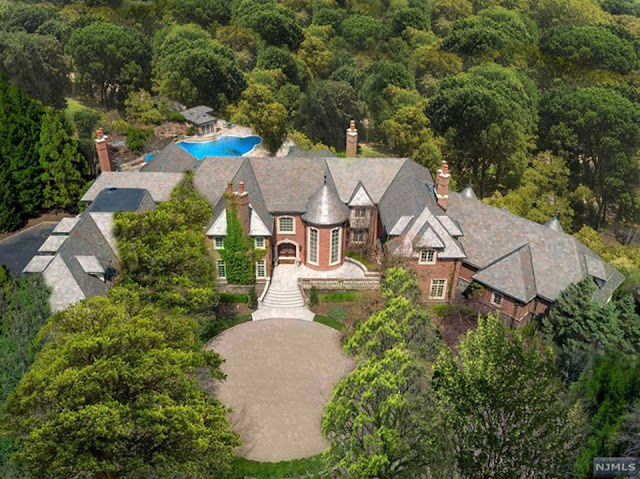 Along with its 11 bedrooms and 22 bathrooms, other notable features include hand-painted ceilings, a family room with a mahogany-framed salt water aquarium, the country's only IMAX home theater with seating for 18, a 3,000-bottle wine cellar, a 20-car subterranean garage, a 4,500 square foot infinity-edge swimming pool with 12' waterfall, and two deep-water docks for those complementary yachts. Whoever bought this pad at auction at this price, is one blessed son of a gun! 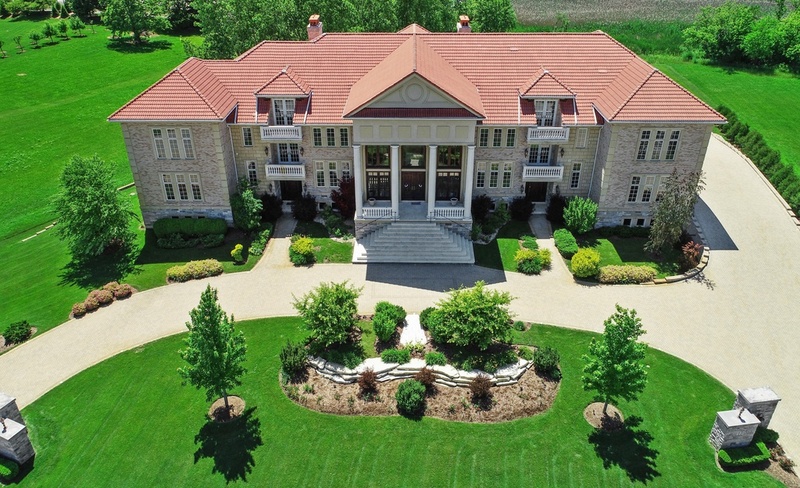 This stucco and stone mansion in Oak Brook, IL is situated on large corner lot in the guard-gated Midwest Club and offers pond views. It features approximately 12,532 square feet of living space with seven bedrooms, eight full and two half bathrooms, two-story foyer with winding staircase, elevator, sunken two-story living room with fireplace, formal dining room, butler's pantry, contemporary-style gourmet kitchen, breakfast room, two-story family room with fireplace, home office, expansive lower level with recreation room, kitchen, and a 10-seat home theater. There is garage parking for four back on the main level. Outdoor features include a porte-cochere, front covered porch, balconies, and a patio. 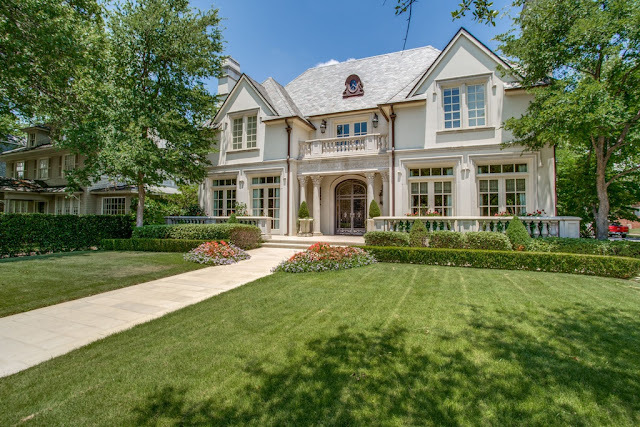 Situated on a large corner lot in the Highland Park area of Dallas, TX, this French-style mansion was built in 2006 and boasts a floor plan that allows an abundance of natural light throughout. The home features approximately 8,664 square feet of living space with six bedrooms, seven full and three half bathrooms, two-story foyer with U-shaped staircase, elevator, a wine room below the staircase, formal living and dining rooms with fireplaces, chef-inspired gourmet kitchen, breakfast room, family room with fireplace, wood-paneled study with fireplace, a wood-paneled exercise room located off of the "hers" master bathroom, an upper level sitting room, and a four-car garage. Outdoor features include a front covered porch, loggia with fireplace, patio, BBQ kitchen, and a swimming pool with spa. This newly built French-style stone mansion in Englewood, CO is situated on 2.36 acres of flat land and boasts breathtaking mountain views. It features approximately 19,535 square feet of living space with seven bedrooms, eight full and four half bathrooms, two-story foyer with double winding staircase, elevator, two-great room with fireplace, formal dining room, butler's pantry, gourmet kitchen with double islands, breakfast room, family room with fireplace, library/study with fireplace, billiards room with fireplace and wet bar, lower level recreation room with wet bar, and exercise room, garage parking for five, and much more. Outdoor features include a motor court, front and rear fountains, front covered porch, balconies, terraces, patio, pergola, swimming pool with spa, and a pool house. This European-inspired brick and stone mansion in Sandy Springs, GA was built in 2008 and is situated on two and a half acres of land. 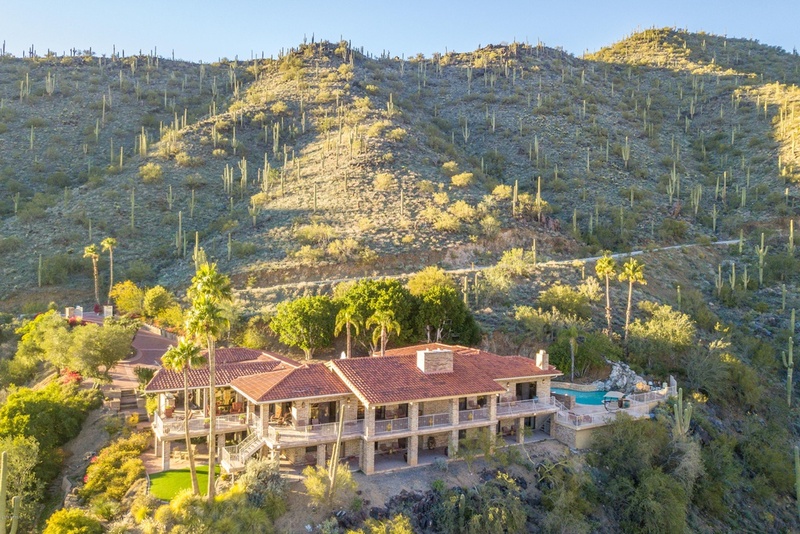 It features approximately 11,480 square feet of living space with seven bedrooms, eight full and two half bathrooms, two-story foyer with floating winding staircase, elevator, two-story great room with fireplace, wet bar, formal dining room, gourmet kitchen with large island and breakfast area, two-story family room with fireplace and media center, rear staircase, wood paneled home office/library, upper level media room with kichenette and an office, lower level recreation room with fireplace, game room with wet bar, wine cellar and tasting room, a 12-seat home theater, and two two-car garages. Outdoor features include a gated entrance, motor court, porte-cochere, front portico, rear loggia, patio, pavlion with BBQ kitchen, free form swimming pool with spa and waterfall, a putting green, and a chapel or flex use outbuilding. 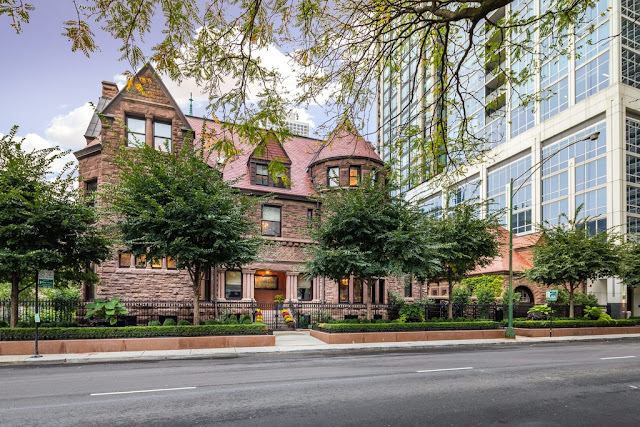 This historic mansion was designed and built in the 19th century for attorney John H. Thompson and has been painstakingly restored to modern standards. The iconic stone home sits directly across the street from Washington Square Park in Chicago's sought after Gold Coast. It features approximately 13,400 square feet of living space with six bedrooms, six full and one half bathrooms, foyer with multi-level floating staircase and fireplace, elevator, great room with fireplace, gourmet kitchen with dining and breakfast areas, home office, an upper level sitting room, lower recreation room with fireplace, wet bar and media room, a lounge, and a spa with rain shower, sauna and Jacuzzi. Outdoor features include a front covered porch, terraces, BBQ kitchen and water features. If you were to envision a blank canvas in which to create your next masterpiece, then this exquisite home would be that canvas! Freshly completed and situated on two acres of land is this Zampolin & Associates-designed stucco and stone mansion in the heart of Alpine, New Jersey's estate section. It features approximately 17,500 square feet of living space with six bedrooms, seven full and two half bathrooms, two-story foyer with staircase, elevator, formal living room, formal dining room with wet bar and glass-enclosed wine closet, butler's pantry, gourmet kitchen with breakfast bar, breakfast room, family room with fireplace, home office with fireplace, lower level recreation room with wet bar, home theater, exercise room, spa room with fireplace and waterfall, and a four-car garage. Outdoor features include a motor court, balcony, Juliet balconies, patios, fireplace, and swimming pool with spa. 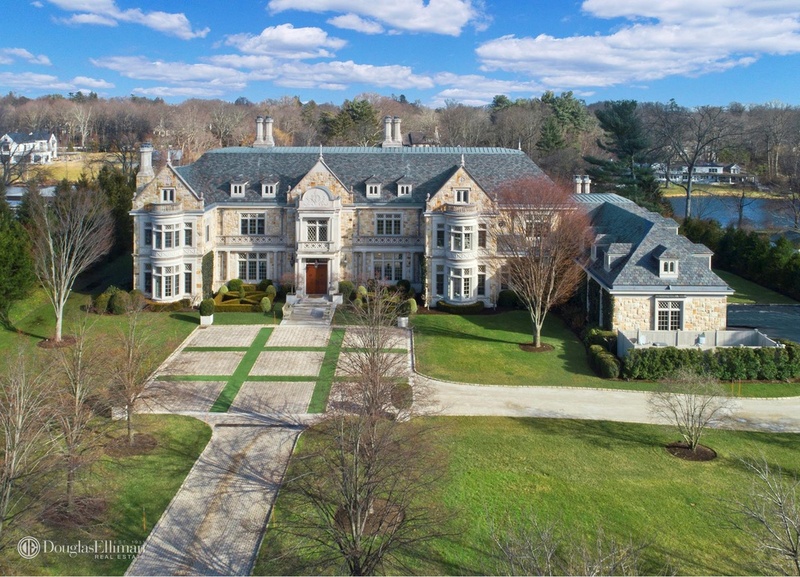 This stately brick and stone-accented mega mansion in Oak Brook, IL is situated on over three of land and features approximately 23,000 square feet of living space. It has six bedrooms, seven full and three half bathrooms, two-story foyer with double floating staircase, elevator, two-story great room with fireplace, formal dining room, butler's pantry, gourmet kitchen with stainless steel appliances and breakfast bar, separate chef's kitchen, breakfast room, family room with vaulted ceiling, fireplace, and media center, rear staircase, wood paneled club room with fireplace, library, recreation room with wet bar, 2,000-bottle wine cellar, 14-seat home theater, 2,000 square foot home gym, spa with hot and cold plunge pool and sauna, heated garage parking for six or more cars, and much more. Outdoor features include a porte-cochere, motor court, fountain, balconies, terraces, patio, 25'x65' swimming pool, pergola, fire pit, putting green, and a lighted basketball court. With panoramic golf course, mountain, and city views, this contemporary mansion in Albuquerque, NM is a one-of-a-kind masterpiece with precise detail to attention. Situated on over two and a half acres of land, it features approximately 12,002 square feet of living space five bedrooms, five full and two half bathrooms, two-story foyer and separate rotunda-style stair hall with floating staircase, commercial-grade elevator, living room with fireplace, dining room, gourmet kitchen with two cook tops, stainless steel caterer's kitchen, family room with fireplace and media center, home office, billiards room, media room, home gym, wine tasting room, nine-seat home theater, a craft room, an attached guest suite, and garage parking for six cars. Outdoor features include a gated entrance, motor court with water feature, balconies, terraces, patios, BBQ kitchen, and rooftop swimming pool with spa. 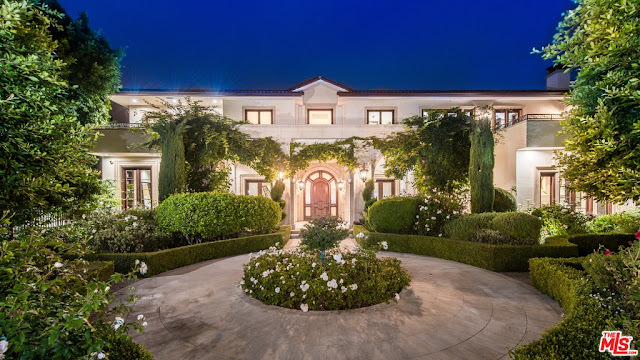 This Mediterranean-inspired mansion in Los Angeles, CA was built in 2010 and is situated on 0.63 acres of land. It features approximately 13,052 square feet of living space with seven bedrooms, 10 full and three half bathrooms, two-story foyer with floating staircase, an elevator, formal living room with fireplace, formal dining room with fireplace, butler's pantry, gourmet kitchen with double islands, breakfast area with floor-to-ceiling curved window wall overlooking backyard, family room with fireplace and wet bar, wood paneled library with fireplace, lower level with media/game room and wine cellar, a four-car garage back on the main level, and much more. Outdoor features include a gated entrance, gated front courtyard, roof top terraces, fountain, BBQ kitchen, swimming pool with spa, and a pool house. 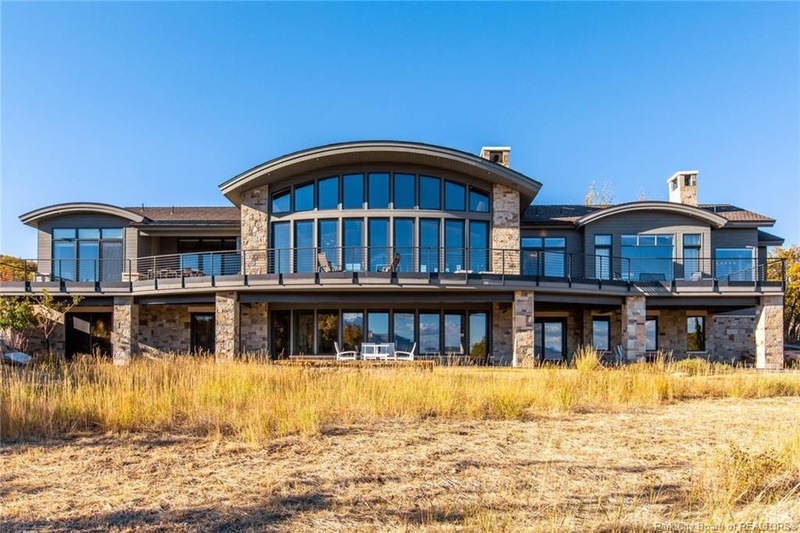 This newly built contemporary-style mansion in Aspen, CO is situated on two acres of land and boasts stunning views of the neighboring mountain ranges. It features approximately 9,964 square feet of living space with six bedrooms, six full and three half bathrooms, two-story foyer/great room with floating open-tread staircase and fireplace, elevator, formal dining room with built-in buffet station, expansive gourmet kitchen with stainless steel appliances, breakfast room, sitting room with fireplace, home office, lower level recreation room with wet bar and wine closet, and a garage back on the main level. Outdoor features include a covered front porch, roof top terraces, deck, and patio with fire pit and spa.